What is the relationship between hunger and nutrition? This seems an obvious concept — if one doesn’t eat enough food to fill their current physiological needs, they feel hunger. Hunger can be temporary, such as not having enough to eat for a meal or a day, or can be enduring when the person does not get enough to eat to maintain his or her physical needs over many days, weeks, months or years. When a person has hunger for a sustained period of time, he or she can develop malnutrition, either mild or severe, depending on one’s body needs and food intake. Malnutrition involves a deficient, excess or imbalanced intake of nutrients for proper tissue and organ function, and it encompasses both overnutrition and undernutrition (Mosby Medical Dictionary, 2009; World Health Organization [WHO], 2018). Overnutrition, a condition of excess nutrient and energy intake over time, may be regarded as a form of malnutrition when it leads to morbid obesity (Mosby Medical Dictionary, 2009). Undernutrition is caused by inadequate food supply or inability to use the nutrients in food, possibly resulting in micronutrient deficiencies, stunting (low height for age), wasting (low weight for height), or underweight (low weight for age) (Mosby Medical Dictionary, 2009; WHO, 2018). 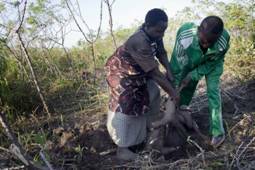 Undernutrition and its consequences are the focus of this article. decaying teeth, among other symptoms (KidsHealth, 2015). Undernutrition is not as visible as severe malnutrition, hence receiving less media attention than famines or outright starvation; nevertheless, it is a much larger and chronic problem. Severe malnutrition, particularly in young children and infants, can lead to death (UNICEF, 2015b). According to the United Nations report on world food security and nutrition, with climate change and increasing conflict, global hunger has increased since 2016, affecting 815 million people (Food and Agriculture Organization [FAO] et al., 2017). However, there is an indication of overall progress, as this number is down from an estimated 900 million undernourished people in 2000 (FAO, 2017). Undernutrition can begin in the womb and propagate across generations when a mother who does not meet nutritional intake requirements during pregnancy gives birth to an already-stunted infant (Reinhardt & Fanzo, 2014). Undernutrition within the first 1,000 days of a child’s life, also known as the window of opportunity, can lead to irreversible stunted growth and has been associated with impaired cognitive ability and reduced performance in school and later in life at work (Reinhardt & Fanzo, 2014). Studies have found that children who are born stunted or become stunted very early in life have greater potential for severe stunting and its long-term consequences into adulthood (Reinhardt & Fanzo, 2014). Chronically malnourished children are more likely to become short adults that birth smaller infants who have lower educational achievement and economic status in adulthood (Reinhardt & Fanzo, 2014). This cycle carries on from mother to child when chronic undernutrition continues generation to generation. Stunting and its effects typically become permanent because reversal usually means changing the basic and underlying causes of malnutrition. Who is most at risk for undernutrition? The World Health Organization (WHO) estimates that 98 million children under five years of age are underweight, or about one in every six children. The prevalence of undernourished people is the highest in Africa, but the absolute number of undernourished children is highest in Asia (FAO et al., 2017). Prevalence is the proportion of a population affected by a disease or showing a certain characteristic (expressed as a percentage), and absolute number is simply the count of people in the population with a disease or showing a certain characteristic. If a specific essential nutrient is not consumed in adequate quantities, a nutritional deficiency can develop, of which a common form is anemia that results from lack of iron (UNICEF, 2018). Diarrhea or infectious disease can cause loss of micronutrients or inhibit consumption of sufficient nutritional foods, weakening an individual to become more susceptible to severe illness, and thus exacerbating the micronutrient deficiency (UNICEF, 2018). Also referred to as “hidden hunger,” micronutrient deficiencies can gradually develop unnoticed until manifesting in irreversible cognitive, physical or immune system impairment (UNICEF, 2018). Vitamin A deficiency, which impacts eyesight among other physiological effects, is another common deficiency, affecting as many as a third of children in middle and low income regions (UNICEF, 2018). The Centers for Disease Control and Prevention (2018) estimates that as many as 2 billion people worldwide, about half of whom are children, are not getting enough nutrients, such as vitamin A, iron or zinc, in their diets. For a more detailed discussion of micronutrients, see the 2018 World Hunger and Poverty Facts and Statistics. 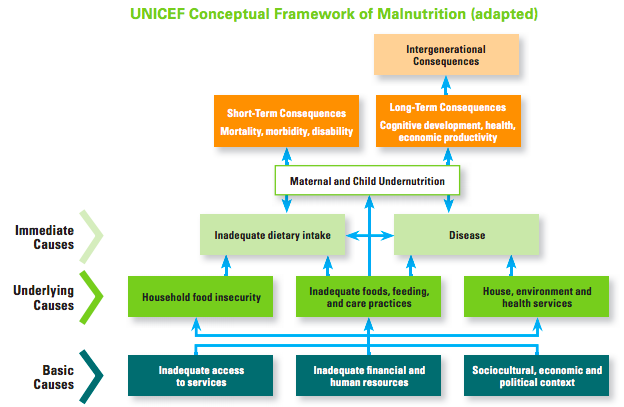 To understand how hunger and malnutrition relate to each other, UNICEF developed a widely recognized model of the underlying causes of malnutrition (Figure 1). Hunger is a result of the immediate causes of malnutrition. The ultimate manifestation of poor nutrition is malnutrition, due to basic, underlying and immediate factors that contribute to this condition. The immediate cause of undernutrition involves insufficient dietary intake of nutritional foods or disease, which can prevent the absorption of nutrients consumed (UNICEF, 2015a). Infection and malnutrition have a cyclical relationship, where inadequate diet can cause weight loss and growth faltering, as well as lowered immunity (UNICEF, n.d.). This leads to increases in incidence, severity and duration of disease. Disease then leads to loss of appetite, mal-absorption of nutrients, and an increased need for nutritional requirements, ultimately returning to the inadequate diet cause (UNICEF, n.d.). The primary diseases that contribute to this cycle in the developing word are diarrhea, acute respiratory infections, measles and malaria (UNICEF, n.d.). Both treating the disease and efforts to improve nutritional status can break the cycle. Contributing to the immediate causes of malnutrition are the underlying causes of malnutrition (UNICEF, 2015a). Whether or not an individual gets enough food to eat or whether s/he is at risk of infection is mainly the result of factors operating at the household and community level. Household food insecurity is the lack of reliable access to safe, affordable, and adequate amounts of nutritious foods for those in the household (UNICEF, n.d.). Inadequate care includes practices such as inadequate breastfeeding or poor dietary intake during pregnancy and in general (UNICEF, n.d.). Lack of public health services and access to clean water, as well as poor sanitation, can contribute to malnutrition by promoting environments conducive to the contraction of disease. The basic causes of malnutrition arise from a variety of complex social, economic and political factors (UNICEF, 2015a). These factors can hinder household food security: for instance, social and food safety nets may not be available for families who may suffer economic hardships; or there is gender inequality, where women and girls are not protected by countries’ laws and customs; and governments’ political and ideological practices may impact income and resource distribution (UNICEF, n.d.). When considering the financial resources aspect of basic causes, if a family does not earn enough income through consistent and sufficient work to buy food and other necessities, the resulting poverty can lead to inadequate food security and inability to access health care services. The basic causes of malnutrition are very difficult and expensive to address, often requiring changes in government programming, protection of vulnerable ethnic groups, and the building up of health, water and sanitary infrastructures, as well as other infrastructures, such as roads, that allow people easier access to the services and foods they need. Until these are adequately addressed, malnutrition will remain the large-scale problem that it is. There are promising signs of progress. In 2016, a year after the Millennium Development Goals (MDG) target of halving the proportion of undernourished people was set to expire, countries not affected by conflict have reduced the prevalence of undernourished people to, on average, just over 10% (FAO et al., 2017). Despite overall progress, there has been only modest improvement in reducing food insecurity in parts of the world plagued by natural disasters and conflict, particularly sub-Saharan Africa and Western Asia. While countries without conflict have largely met the MDG target in 2015, countries affected by conflict, in fragile situations or with prolonged crisis generally have not met the MDG target (FAO et al., 2017). Looking ahead, the Sustainable Development Goals (SDG) aim to end hunger and all forms of malnutrition by 2030, although there is concern that on the current trajectory, this goal will not be met (FAO et al., 2017). When examining the undernourishment prevalence indicator for progress toward the SDG goal, the world has seen approximately only a 4 percent decline in prevalence over the past decade – from 14.1% to 10.7% (FAO et al., 2017). For low and middle income countries also facing instability, the complex relationship between political insecurity and nutrition becomes an issue of particular relevance when attempting to meet the SDG goal. Reinhardt, K., & Fanzo, J. (2014). Addressing chronic malnutrition through multi-sectoral, sustainable approaches: a review of the causes and consequences. Frontiers in nutrition, 1, 13.